Ska ni arrangera en irländsk pubafton? … eller kanske avnjuta en pint till trevlig irländsk/skotsk musik i baren? Dún Aengus är en duo som spelar irländsk musik og består av Peter Andersson och Martin Rahmberg . Dels klassiska irländska visor men även traditionell dansmusik, såsom jigs och reels. Peter och Martin har sedan cirka tre år tillbaka hela världen som vårt arbetsfält med spelningar i bland annat USA, Frankrike, Italien, Grekland, Holland, Danmark, Norge och Sverige. Bland de trevligaste framträdanden de gjort har dock varit på våra svenska och norska krogar, bygdegårdar, wärdshus och gästgiverier mm. 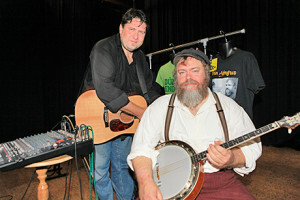 The first time I ran into the Irish music duo Dun Aengus was at McGuire’s Irish Pub in Pensacola, Florida in March 2010. It was the last night of the Renaissance Faire and a handful of us met up at the pub for a drink. They were a great band that night, playing a lot of the classic Irish drinking songs I’ve grown to love. I would have gone up to the pub to see them again but they were on tour and leaving for south Florida the next day. I caught up with them again this past St. Patrick’s Day, once again at McGuire’s. They were rocking the house with popular Irish and Scottish tunes and a few popular American classics for good measure. Just like last year, Dun Aengus had the crowd enraptured, gathered on the floor in front of the stage dancing with wild abandon to these classic sing-alongs. The Irish was certainly high that night. Hailing from Sweden, Dun Aengus consists of Peter Andersson on banjo and vocals, and Martin Rahmberg on acoustic guitar and vocals. Martin’s gruff singing style contributes a real rootsy “beer and tobacco” quality while Peter’s smoother harmonies and verses compliment and broaden the sound. Peter’s banjo leads also carry the melodies that distinctly bring out the Celtic quality of the music. Their repertoire includes such classics as “Whiskey in the Jar,” “The Wild Rover,” and “All For Me Grog.” Dun Aengus is an excellent Irish music duo worthy of some support. I’ll be keeping track of them so I can catch them again next time they‘re in town.